Guys. I have a lot of thoughts about this documentary, but I’ll keep this review short. As someone who battled sleep paralysis daily for 19 years, I had high hopes and expected The Nightmare (2015) to shed new information about the misunderstood sleep condition. Instead, I got weak re-enactments of the documentary subjects’ hallucinations and zero scientific clarification about sleep paralysis. There’s literally one sentence in the opening credits explaining what sleep paralysis is, and then discordant montages of “alien abductions,” “demonic possessions,” “Shadowman,” and other paranoid conspiracy theories linking sleep paralysis with the paranormal. To say I’m disappointed is an understatement. So let me break it down for you without scare tactics. If you’re like me, you also get crazy, intense hallucinations and temporary amnesia. I used to wake up each morning not even remembering what my name was. Panic attacks and night terrors haunted me almost every night, and as a child I slept in bathtubs at sleepovers, hid inside kitchen sink cabinets, and laid awake for hours, to the point of exhaustion, just to avoid falling asleep. I found no relief until starting relaxation therapy with a professional therapist. It is tempting to link sleep paralysis with demons, alien abductions, and other paranormal phenomena, but I assure you, sleep paralysis is a medical condition and can and SHOULD be treated. I only wish the filmmakers had taken a scientific approach instead of misleading people. Recently I watched a fun documentary about Zombies and Pop Culture and one of the topics discussed is the Slow Zombies vs Fast Zombies debate. Let’s talk about the Slow Zombies for a minute. They are these reanimated corpses that shuffle around and if they catch you, they eat you. I think what makes these zombies scary is that they were the first type of zombie to enter pop culture. Imagine seeing your loved one as this decaying thing shuffling toward you. You know that you should run but there’s something stopping you. Something that wants to believe that you can snap them out of whatever murderous spell they’re under. Now with the Fast Zombies we have these decaying humanoid things that can outrun you and tear you pieces in minutes. Imagine that you’re out and about when you see five of these creatures. They see you and the chase begins. You know that if you can’t outrun them, your new name is going to be Dinner. You don’t have time to see who it is that’s chasing you, all you care about is staying alive. For me, I think that Fast Zombies are scarier. Just for the simple fact that I’m out of shape, I know that I’d probably be the first to go. What also makes them terrifying is that they won’t stop at nothing to get you. For example, the World War Z zombies didn’t stop for anything. They smashed through windows and doors to get to their victims. Also they made a giant zombie pyramid just to get over a giant wall to get their next meal. Slow zombies would probably shuffle around in circles. Hell, even The Walking Dead zombies move faster than the slow zombies. 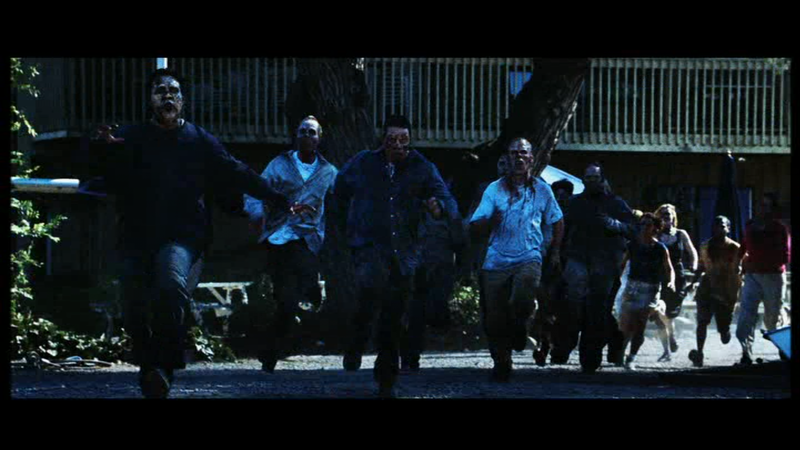 I think the Walking Dead Zombies are the best combination of slow and fast zombie. When they’re inactive they just shuffle around, but when they find something to eat they pick up speed. Which Zombies do you prefer? Fast or Slow?